Markets are awash with red as investors react to weak economic data out of Europe and Asia. 1. Seeing red: Investor sentiment around the world took a knock from an HSBC report showing China's manufacturing sector turned in its weakest performance in six months in November. The gloomy mood was compounded by data from Markit showing activity in manufacturing and services in the eurozone hit a 16-month low in November. The data showed France and Germany -- Europe's two largest economies -- were particularly weak. U.S. stock futures are dipping down, major European markets are firmly in the red in early trading and most Asian indexes also closed with losses. The U.S. government will post weekly jobless claims at 8:30 a.m. ET. At the same time, the Bureau of Labor Statistics will report the latest inflation data. At 10 a.m., data on existing home sales will come out. 2. General Motors: Arizona has filed a $3 billion suit against GM (GM)over its spate of recalls, according to The New York Times. The state is reportedly claiming that the automaker intentionally misled consumers, and that some of its top leaders were complicit in the alleged misdeeds. 3. Market movers -- Gold, Salesforce.com, Target: Gold prices are continuing their decline Thursday after falling by about 5% over the past month. The slide this week comes after a poll showed weak support among Swiss voters for a referendum that would force the central bank to boost gold reserves. Shares in Salesforce.com (CRM) are set to tumble by about 5% when the market opens after the company reported its latest set of quarterly results. The earnings were slightly better than expected, but the company's outlook disappointed investors. Shares in Target (TGT) are edging down by 2% premarket after shares, partially reversing gains of more than 7% the previous session. 4. Earnings: Best Buy (BBY), Bon-Ton Stores (BONT) and Dollar Tree (DLTR) are among the main companies reporting quarterly earnings before the opening bell. Gamestop (GME) and Gap (GPS) will report after the close. 5. Wednesday market recap: U.S. stocks closed lower Wednesday. 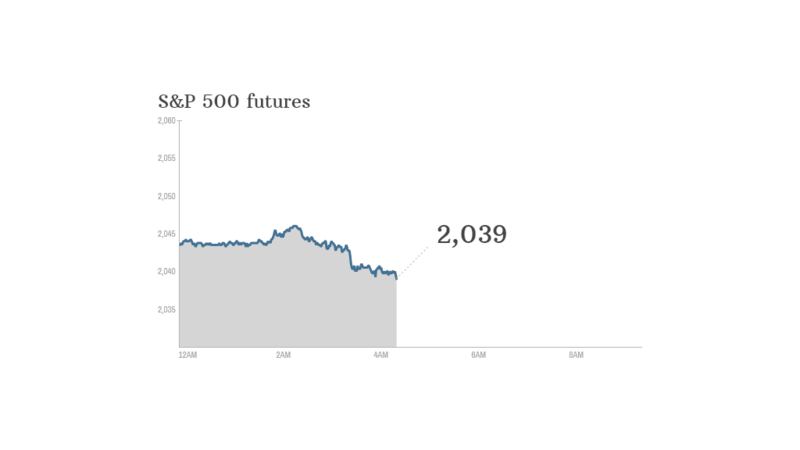 The Dow Jones industrial average ended flat while the Nasdaq slid 0.6% and the S&P 500 fell 0.2%.